'Jericho of Scotland Yard' is a well written and intelligent police procedural with some wonderful added twists to take it out of the realm of your typical cop show. 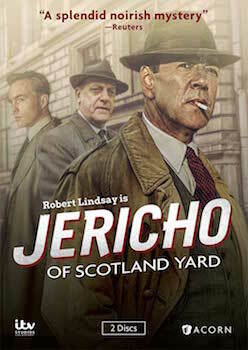 From its title you’d expect Acorn Media’s new DVD, Jericho of Scotland Yard to be your typical police procedural. However, while the action in the series’ four feature length episodes does revolve around police solving cases, the show is so much more. While the series originally aired on television in 2005 there is nothing dated about it 11 years later. Set in London of the 1950s the show creates a dark and mysterious world through which the lead actors move through. 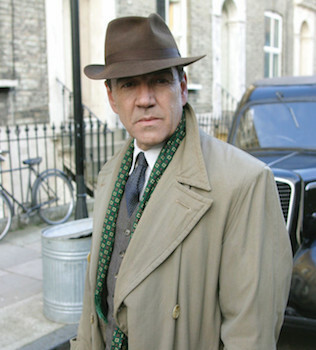 Inspector Michael Jericho (Robert Lindsay) is the new darling of the media for his exploits in capturing notorious criminals. We’re introduced to him via a news reel informing us he’s been awarded a commendation for bravery. The opening of the first episode also introduces us to his long suffering Sergeant, DS Clive Harvey (David Troughton) and his new, very green constable, DC John Caldicott (Ciaran McMenamin). While the latter comes on the job idolizing his new boss, Harvey has worked with Jericho long enough to know his boss’s demons and his flaws. While each case the three officers deal with is a distinct investigation and interesting in their own right, just as intriguing is the continuing story of Jericho’s life. The London he moves through is a dark and mysterious place. 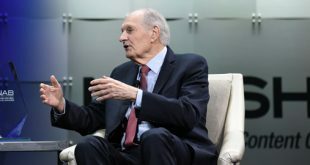 He lives in a three story walk up above a local store in Soho – a seedy part of town in the 1950s – and seems more comfortable with the jazz musicians and prostitutes who ply their trade in his neighbourhood than with any other class. The creators of the show made the decision to mix location and studio shooting together for the exterior shots of London. This has allowed them to create a Soho of shifting colours and moving shadows which not only reflects Jericho’s moods, but creates a noir ambiance that suits the sleazy underworld he and his team have to trawl through in their investigations. With the majority of location exteriors being shot either in overcast conditions, if not raining, or at night, this is a city where the sun is rarely seen. This moving through darkness is further stressed in the final episode set in the famous fog of 1952 which resulted in so many deaths and almost completely closed the city. The writers have also done a wonderful job in creating stories which reflect the turbulent times London was beginning to experience in the 1950s. Everything from post war immigration from Jamaica and the rise of British neo-Nazis to soldiers suffering from Post Traumatic Stress Disorder to homosexuality are dealt with intelligently. Even more importantly the subjects are dealt with appropriately for the time period. Of course one of the great pleasures of watching a show like this is seeing all the different people who make guest appearances as villains and victims. Some of them are fairly instantly recognizable, but a few might drive you crazy as you try to figure out where you’ve seen them before. It helps to remember this one was shot more then a decade ago and they all look a lot younger than we’re used to seeing them. Jericho of Scotland Yard is a well written and intelligent police procedural with some wonderful added twists to take it out of the realm of your typical cop show. Highly enjoyable, and very entertaining, this two disc set containing all four episodes of the series will make a nice change from the average murder mystery.